The University of Birmingham has taken out a £75 million loan as it bids to become one of the best universities in the world. The institution announced it had secured the cash to give its Edgbaston campus a facelift. The 32-year loan was granted by the European Investment Bank, which in recent years has provided the backing for major projects including the new Queen Elizabeth Hospital and the M6 Toll route. 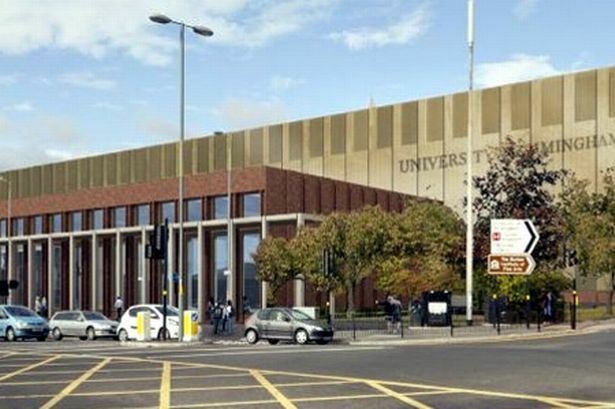 University bosses said the cash would help bring the campus closer to the vision of its founder, former Birmingham mayor Joseph Chamberlain. Plans include new centres for teaching and research, a new sports centre – complete with Olympic-sized swimming pool – and re-developing the main library. Agreement papers for the investment programme were signed on campus last Friday by vice chancellor Prof David Eastwood and bank vice president Simon Brooks. Prof Eastwood said: “The University of Birmingham is a leading global university which offers an inspirational student experience. “Although we are very proud of the Edgbaston campus we want to undertake significant and exciting projects to develop our estate that will benefit students, staff and the area. Plans were submitted last month for the proposed sports centre, which will house Birmingham’s only 50-metre swimming pool and will be open to the public. The £75 million will also be used to make the Edgbaston site more energy efficient. Birmingham is the latest university to secure funding from the European Investment Bank, which has stumped up £1.9 billon to fund UK education projects in the past five years.